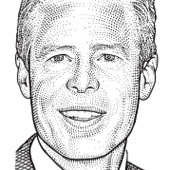 While Jeff Bewkes only recently became president and CEO of the media behemoth at the beginning of this year, he has long been an influential executive at Time Warner HQ. Mr. Bewkes has been COO, as well as president, since 2005 and has run major parts of the disparate businesses of the conglomerate. That has included its digital assets, like AOL, despite the fact that he was also a prescient critic of the merger of AOL and Time Warner. Mr. Bewkes made his chops in the entertainment arena, especially at Time Warner's HBO division in its glory days of growth. With an undergraduate degree from Yale University and an MBA from Stanford Graduate School of Business, he also has an impressive educational pedigree. With all this, we'll want to know what he can dream up to keep Time Warner relevant in the Internet business. That thing we sorta said last month? Just kidding! An 11-page guided tour of the future. If you’re in a hurry, we’ve got the Cliff’s Notes here. We found that it’s not worth doing. After some time, the productivity of people comes down because it’s a monotonous job. They lose their interest.